Anyway, we took our lunch at Roadhouse, SM and did the grocery afterwards. 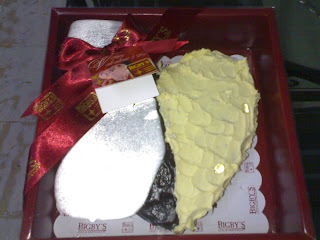 My husband also bought a cake from Bigby's to serve as our dessert --- at home :D We arrived home past 4pm and I was really tired and drowsy. My daughter and I took an afternoon nap but we woke up instead around 6:45pm! My husband decided to cook dinner for us (I requested, hehe) and ate dinner kinda late. 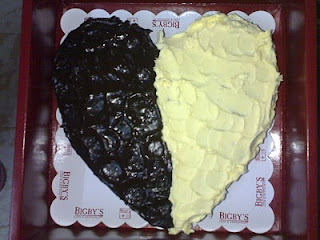 So my Yummy Sunday entry for this day is about the Valentine's Cake from Bigby's. I husband said it's his gift for me and for our daughter, Chloe. And please join Perfectly Blended every Sunday and share to us your yummy foods! i love the taste of this cake! some strawberry with chocolate - literally mouth watering and very satisfying!!! gosh, it's the middle of the night and i'm craving for that NOW! HAHAHA!!! great post coox!